An earthquake measuring at 6.9 magnitude has struck off Honshu island in northern Japan, prompting a tsunami advisory which anticipated waves of up to 1m in height in Iwate Prefecture. People in some coastal areas have been advised to leave their homes. The quake was recorded at around 8 am local time at a depth of approximately 10 kilometers. The epicenter was located off the Sanriku Coast, extending from southern Aomori prefecture, through Iwate prefecture and northern Miyagi prefecture.The strong quake could even be felt in in Tokyo, 690 kilometers away from the epicenter. Japan Meteorological Survey issued a tsunami advisory for the Iwate Prefecture, warning that the waves may reach 1 meter in height. Two hours after the initial quake the agency lifted the tsunami warning for the country's northeast coast. 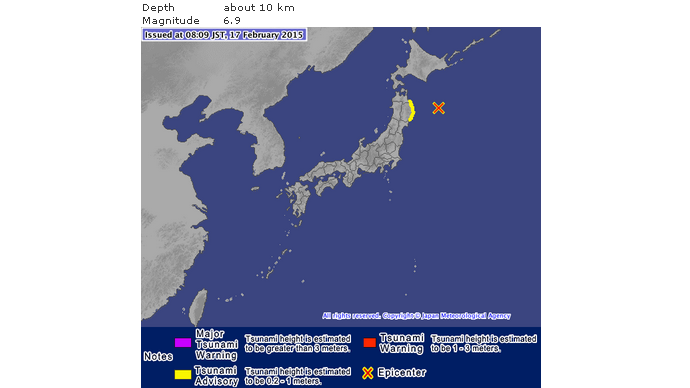 Japan Meteorological Agency says 10cm #tsunami observed in Miyako and Kuji, Iwate Pref., after magnitude-6.9 #quake. Small tsunamis of some 10-20 centimeters reached the shore about 45 minutes after the initial reports, with people being advised to stay away from the coastal area. There were no immediate indications of damage or injuries. An evacuation order was also issued for coastal towns in Iwate prefecture in the meantime. Thousands of people were reportedly leaving their homes while boats wereare sailing out of the harbor. “We are using the emergency broadcast to advise people to keep away from the sea ... the quake was pretty strong and lasted a long time so I thought there would be a tsunami warning," Kozo Hirano, an Otsuchi Town official in Iwate, told NHK. There were no irregularities reported at the Onagawa and Higashidori nuclear plants in nearby Miyagi and Aomori prefectures, the facilities’ operator Tohoku Electric Power Co. said. A spokesman for Tokyo Electric Power Coalso reported no irregularities at Fukushima Daiichi and Fukushima Daini plants. The Pacific Tsunami Warning Center in Hawaii said there was no danger of a "destructive" Pacific-wide tsunami. The earthquake struck in the same region hit by a devastating 9.0 quake back in March 2011 which triggered a tsunami that crippled the Fukushima Daiichi nuclear power plant and killed more than 18,000 people. Japan is still battling the consequences of the three meltdowns and struggling with the clean-up of the nuclear catastrophe aftermath.